In an extraordinary international response, a dozen nations have poured assets into the stormy South Atlantic to help find and save 44 Argentine submariners from the missing sub San Juan. It’s a stark contrast to the last great submarine disaster, when Russia was slow to accept international help for the stricken Kursk in 2000 and lost all 118 souls aboard. The Argentine Navy submarine San Juan in drydock. From Jacksonville Naval Air Station in Florida, the US Navy has deployed two of its latest long-range, land-based patrol plane, the P-8 Poseidon (whose main mission, ironically, is to find submarines and sink them, not rescue). One aircraft came straight from Florida while the other was diverted from counter-drug operations out of El Salvador. They are joined by a NASA Arctic exploration aircraft, a civilianized P-3 Orion — the P-8’s predecessor. The Navy has also deployed a panoply of rescue equipment for both deep and shallow water, since the depth at which the submarine has sunk is unknown. The newly created Unmanned Undersea Vehicle Squadron 1 in Pearl Harbor has sent three Iver 580 UUVs — able to operate up to 325 feet for up to 14 hours — and one much larger Bluefin 12D — able to operate up to “almost 5,000 feet” for 30 hours. Undersea Rescue Command in San Diego has sent both its shallow-water Submarine Rescue Chamber — able to rescue six sailors at a time from a depth of up to 850 feet — and the deep-water Pressurized Rescue Module — able to rescue 16 at a time from up to 2,000 feet under. The PRM, almost uniquely, can connect to a downed submarine’s hatches even if the sub is pitched at a steep angle on the ocean floor, something that defeats most rescue systems. All this specialized equipment is heavy: It took three Air Force C-17s and one massive C-5 Galaxy to deliver. UPDATE The Submarine Rescue Chamber — a kind of diving bell also known as a McCann Chamber — is the only system that’s ever successfully rescued submariners in a real-life emergency, 33 survivors of the USS Squalus way back in 1939.The more sophisticated Pressurized Rescue Module has only seen tests and exercises, said naval historian Norman Polmar. Both designs must be lowered into the water from a surface ship and can only operate in relatively calm weather, he added, which has not been on offing in the South Atlantic lately. UPDATE The US Navy used to have a pair of mini-subs, the Deep Submergence Rescue Vehicles, that could conduct a rescue in any weather, because they were launched underwater from a full-size submarine, Polmar said. Those craft went out of service by 2008. UPDATE But no rescue equipment can be used until we find the downed submarine, Polmar said. That’s even harder than hunting an active, hostile submarine because a stricken sub isn’t making noise by turning its propeller or running its engine. Modern submarines have emergency signal buoys that float to the surface with an emergency radio transponder to broadcast their location, but there has been no signal from San Juan yet. UPDATE So finding the missing submarine requires combing the area. “You just tow along the bottom magnetometers, cameras, and sonar,” Polmar said, “but sonar’s going to pick up a lot of other things,” as was the case with at least one false report of a sonar contact. While aircraft search areas faster, surface ships can tow larger sensor arrays. 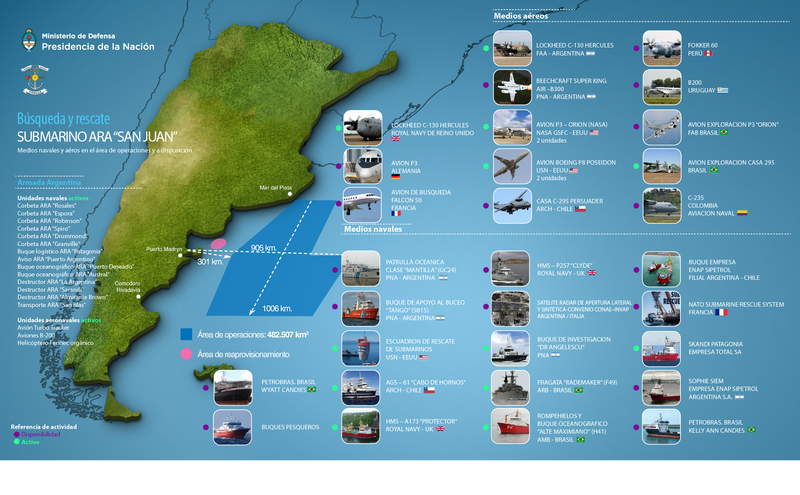 Argentina’s South America neighbors Brazil, Chile, Colombia, Peru, and Uruguay have all sent either ships or aircraft. Brazil, once Argentina’s rival for influence in the region, has sent the most: two planes, two government vessels, and two ships from the national oil company Petrobras. From Europe come more aircraft — British, French, and German — and ships: two Royal Navy vessels and a Norwegian cargo ship. The multinational NATO Submarine Rescue System is also on call, and Italy is contributing satellite surveillance. Can all these assets actually help, or is it already too late? The worst-case scenario is that the San Juan, which was returning to base with battery problems, already suffered a catastrophic failure that killed all aboard. This could have been a hull breach: The German-built sub entered service in 1985 and is past the hull’s 30-year design life. Or, if the sub sank to the sea floor in the open ocean, beyond the continental shelf, it would have descended beyond its crush depth and been destroyed. US Navy Submarine Rescue Chamber (SRC) prepped for air transport. If the San Juan sank in shallower waters, however, its crew could still be alive, for now. Unlike the US Navy’s nuclear-powered vessels, which have effectively infinite electricity to purify their air, the San Juan is a diesel submarine that runs on battery power when submerged below snorkel depth. Argentine Navy spokesman Enrique Balbi said the sub had enough air to survive seven days, and it went missing on the morning of November 15th — six days ago. The most optimistic estimate I’ve seen, by an outside expert, was 10 days of air. The absolute best case is that the San Juan is on the surface, not submerged, just adrift and unable to communicate. This scenario seems sadly unlikely, however. The San Juan was submerged as of its last communication (subsequent reports of satellite calls and sonar returns proved false). Satellites, aircraft, and surface ships have been searching the area where it disappeared for almost a week, but heavy weather in the South Atlantic has lowered visibility. That weather, however, poses another problem. 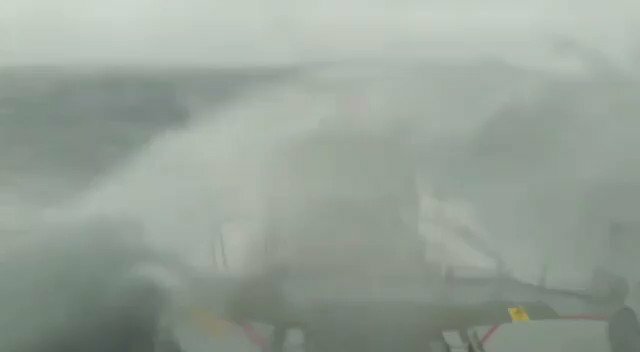 The Argentine Navy posted a video of waves breaking over the deck of one of its ships and onto the bridge windows. A submarine, lying much lower in the water, would be tossed about unmercifully, and one with a major malfunction such as a power failure might not stay afloat. As fast as international help pours in, time is running out for the San Juan. Regardless of the outcome of the search, there is still some good that could come of this. The outpouring of support from both the Americas and Europe should help strengthen international naval cooperation and generate a bank of goodwill even if the 44 sailors are never found. As the desperate, multinational search for a missing Argentine submarine continues, the country’s navy said on Thursday that a sound “consistent with an explosion” had been detected near the site where the vessel disappeared last week with 44 crew members on board.